Deeproot Warrior (Urwurzel-Krieger) inkl. 0% MwSt. 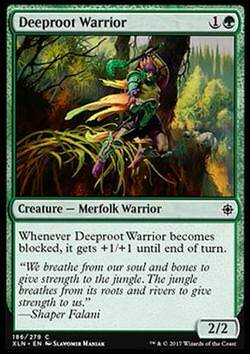 Regeltext: Whenever Deeproot Warrior becomes blocked, it gets +1/+1 until end of turn. Flavourtext: ""We breathe from our soul and bones to give strength to the jungle. The jungle breathes from its roots and rivers to give strength to us.""